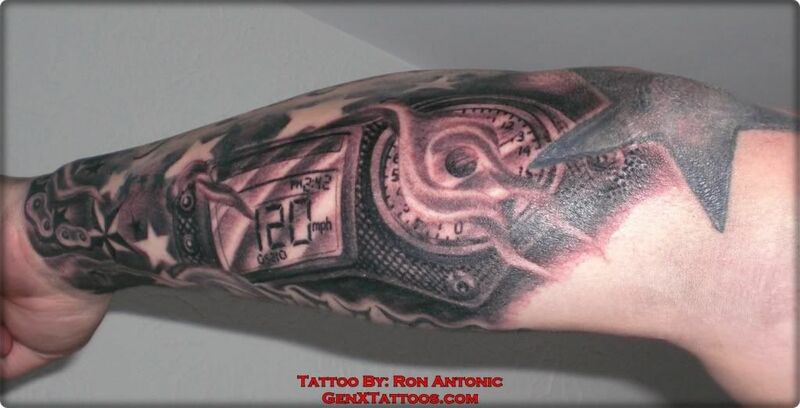 Location: Suprise A.Z, Where the big apple is..
my guy ron antonic @ www.genxtattoos.com does amazing work.. i gave him a few things i wanted in there and he drew this up on his own..
going back thursday to fill in the rest of my arm with more bike related stuff..
ill post new pics when im done. I thought it was gonna be some gay *** boring sprocket and chain tattoo, but that is just outrageous. Off the ******* charts, ballin'. Looks tight. just got home and finished up to my elbow today !! came out even better than i expected !! wow, this keeps getting better. but it isnt 2:42, your clocks wrong. and signifigence to the time/millage on the guages? naww it was just kinda random..
he told me to pick and thats what i said..
120 must be a common mph... a friend of mine has a zx10 cluster on his arm and it's on 120 as well. i want to get one like tht one , would you send me the full image of the sproket?